El restaurante Can Fusté te espera cerca del Camp Nou, en la zona alta de Barcelona. Es un lugar con una cuidada decoración clásica, donde destaca la madera, el vidrio y la luz natural, que lo convierten en un lugar muy acogedor. Su gastronomía brinda la mejor cocina mediterránea, centrándose siempre en el producto, que es sinónimo de materias primas de calidad, como su pescado y marisco de playa y su carne selecta, con un sabor muy especial. Todo servido con un cariño y una profesionalidad dignas de destacar. Desde 1973 ofrece calidad y buen hacer. Su servicio es profesional y encantador. Comer aquí es una apuesta segura por la calidad y la satisfacción. The food is over price. My husband informed the waiter that I am not eating pork, yet the waiter gave me and when we informed him, he didn't do anything about it nor a single apologize!! For small plate of arroz seco cost me €30, pan con tomate was €12, my kids having a potato pure with boil egg and very thin fried potato this cost €14 each!! If you doesn't care about money, this is a good place for you. My wfe and I had another wonderful meal at Can Fuste. The owners, Carlos and Maria, are very hospitable and the food and service are superb. We especially highly recommend the ham and the egg with creamy potatoes appetizers...and the fantastic razor clams, if they have them. We look forward to returning again and again and again!!! ???????????????????????????????????? My wife and I had another excellent meal at this very good restaurant. We especially recommend the ham, which is equal to the best we have eaten...absolutely delicious. And I also recommend the unique egg with creamy potatoes appetizer!!! Lastly, say hello to the very friendly and helpful owner. Enjoy!!! They were veeeery nice. Food was outstanding. Wonderful after Barca match dinner. The ham is fantastic; the canoli entree was great; the tomato bread is special; and the hostess and host are extremely cordial. Everything to like...Nothing at all to dislike!!! The food in Can Fuste was ok, but no more than that. 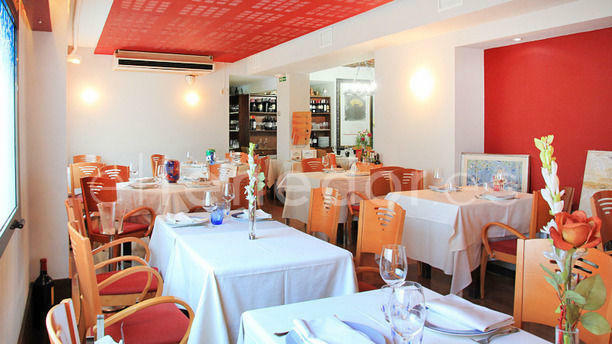 In Spain we have had diner in various other restaurants that was better, more refined and less pricey. Of course this is Barcelona but Can Fuste is overpriced. The service is ok as well, but a bit sniffy. All in all a bit disappointing.